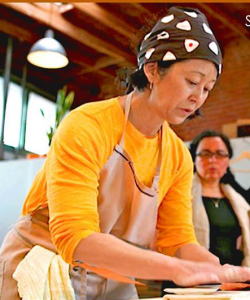 The Japanese American National Museum, 100 N. Central Ave. in Little Tokyo, welcomes writer and chef Sonoko Sakai, founder of Common Grains in Los Angeles, and Myoho Asari, owner of Saiki Kojiya in Oita, on Saturday, May 25. A free seminar, “The Japanese Pantry and Koji,” will celebrate koji, the fermented medium that creates much of the unique flavor and umami in Japanese cooking. Asari and her family have vested generations in selling and promoting this incredible food. The seminar will showcase koji and its many uses and health benefits. This program, part of the Tateuchi Public Program Series, is sponsored by the Atsuhiko and Ina Goodwin Tateuchi Foundation. 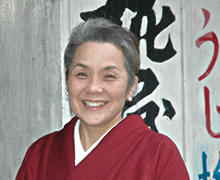 At 11 a.m., Asari and Sakai will present a Kojiya cooking workshop as part of JANM’s Lifelong Learning Series. The cost is $75 for JANM members, $85 for non-members. Since ancient times, rice has been the most important crop in Japan. Every village had a shrine where people would go to pray for a good harvest and good health. Where there was a shrine, there was a koji-maker, who used the koji mold to ferment rice, wheat and soy beans to produce such Japanese staples as sake, soy sauce, miso, rice vinegar, and amazake (a fermented rice drink). Amazake is traditionally served at shrines during New Year’s and throughout the year to promote health. With the industrialization of koji-based products, artisanal koji makers have dwindled to about 1,000. In the last few years, Asari has led the educational outreach about artisanal koji-making traditions directly to Japanese cooks and chefs, who are now driving the renaissance in koji fermented foods. Sakai will present a hands-on cooking workshop on Saturday, June 1, from 5 to 7 p.m. at the Japanese Cultural and Community Center of Northern California, 1840 Sutter St., San Francisco. The cost is $75 for JCCCNC members, $85 for non-members. Sakai is the author of “The Poetical Pursuit of Food: Japanese Recipes for American Cooks” and has contributed stories and recipes to The Los Angeles Times. To register online, go to http://bit.ly/TofuKoji. For more information, call (415) 567-5505, email [email protected] or visit www.jcccnc.org.